LG announced the new Optimus L Series II family of smartphones last month and, following the arrival of the 4.3-inch L7II in Russia in February, the next device — the 4.0-inch L5II — has launched in Brazil, its first stop of an international rollout across Latin America, Europe, Asia, the Middle East and Africa. 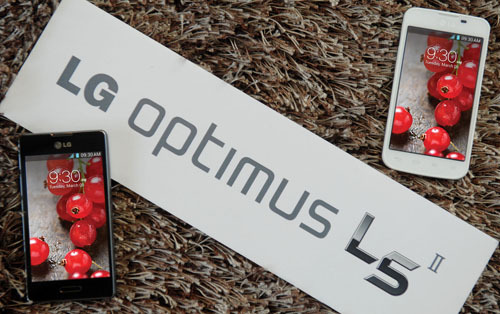 The L Series II is the follow-up to its mid-range L Series range, which sold more than 15 million units and backed up high-end devices like the Optimus G and Optimus G Pro. The other phone in the series is the 3.2-inch L3II. The L7II is, like the others in the L Series II family, available in both single and dual SIM format. It runs Android Jelly Bean, is powered by a 1 GHz single core processor, and includes 4 GB of memory and a 5.0-megapixel camera. The device is available in indigo black, white, pink and titan colors. The software included in the L Series II phones includes LG’s usual bundle — such as QSlide, QuickTranslator, QuickMemo — in addition to Quick Button, a new tool to let users personalize a hotkey to launch any app from the device quickly. Dr. Jong-seok Park, president and CEO of LG Mobile called the phone “another great option among devices in the premium 3G market”. There’s no time frame on the rest of the rollout, with the announcement from LG stating that the device “will be initially available in Brazil followed by single and dual SIM models in South and Central America, Europe, Asia, Russia, the Middle East and Africa”.